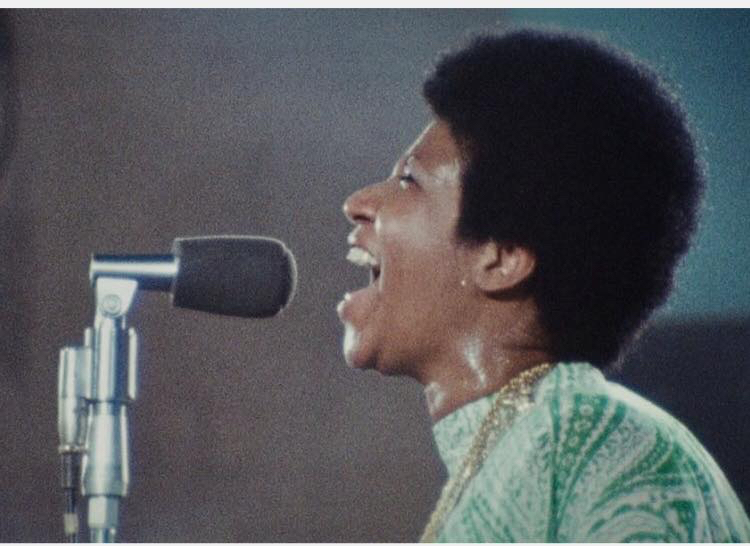 In 1972 Aretha Franklin was just 30 years old, and already a star, when she recorded the gospel album “Amazing Grace” LIVE at New Temple Missionary Baptist Church in Los Angeles. The two night event was filmed but was never released… until now. I had the great privilege of seeing it tonight at the #DocNYC Film Festival. At the SVA Theatre on 23rd Street, Franklin’s family and all manner of gospel and entertainment royalty were in attendance. Rev Al Sharpton did a heartfelt invocation. The Rev. William Barber delivered a fiery benediction. Even funnyman Chris Rock and his girlfriend, Megalyn Echikunwoke, were in the attendance. In between, there was magic, which is an oft-used word these days, but in this case well-earned. Now, if you’ve heard the album, Amazing Grace, you know it’s an extraordinary work of art. But there’s something about seeing the recording unfold that’s very different. First, Aretha is restored to us. She makes her entrance glowing, young, and vibrant, flawless in face and voice. Just three months after her death, the audience can’t help but catch its breath. Then, there is the alchemy of the black church and a gathering of some of its greatest talents. Aretha is accompanied by the peerless Rev. James Cleveland and his Southern California Community Choir. So this is CHUURCH church! Just watching the choir director, Alexander Hamilton, is pure pleasure. The man fairly levitates for an hour and a half. Franklin’s band is a wonder. The great Clara Ward makes a grand entrance and is given a place of honor, lending even more gravitas to the moment. At one point, Ward’s mother jumped up out of her seat and was filled with the spirit so much, that she ran up the aisle and tried to touch the hem of Aretha’s garment, literally! Franklin’s father, the legendary Rev. C.L. Franklin makes an appearance, speaks of his powerful admiration for his daughter, and, with unbridled pride watches her bring the house down with Never Grow Old. Periodically, the camera finds Mick Jagger hovering in the audience, but this is a journey into BLACKNESS. All caps required, with that heavy throat sound on the “ack.” If you grew up in a black church, attend one or used to attend one, this film is a transport device. It took me to New Rising Sun Baptist church, circa 1980-something, on a third Sunday, watching the Soul Specials sway up the center aisle. Aretha’s effortless piano playing sent me to my Uncle Edward’s church up in Dubach, LA, where I watched his wife, my Aunt Ruthie, flow across the piano keys in much the same way. I can’t say where it’ll take you, but you going somewhere. And then there is the voice, which is basically a visitation from another realm. If by chance you had forgotten your memory is replenished when she hits the first note of the first song—Wholy Holy. I swear you feel it in your spinal fluid. Then she proceeds to remind us over and over again why there is only one Queen. 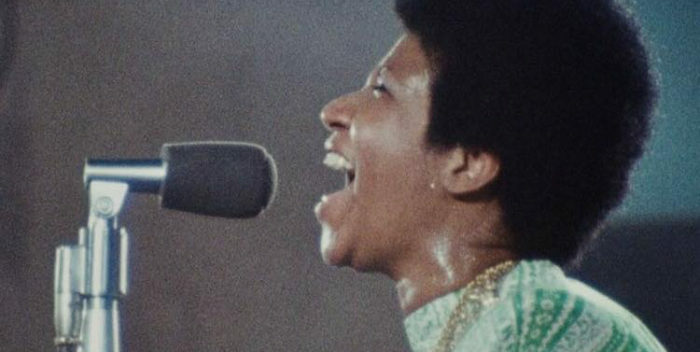 “Amazing Grace” quickly makes you forget you’re at the movies. Even with some of the wonky technical aspects of vintage film stock, the bulky equipment everywhere, and the crew stumbling about, the fourth wall quickly dissolves. You’re not in a theatre, you’re there in Los Angeles in 1972. This lost and now found treasure is a transcendent experience. 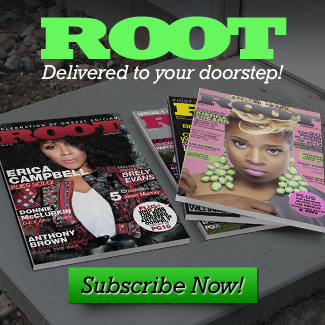 Word is it’ll be released nationwide before the end of the year. Be on the lookout. Take someone with you who will understand. And don’t forget your Kleenex.